Yes, you can make Make ₦200,000 Monthly from popcorn business! 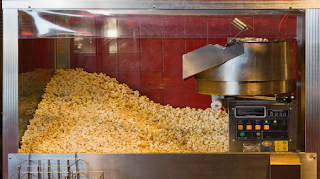 If you are looking for a business you can start with a very small amount of money then you should try looking at the option of starting a pop corn business. A friend of mine way back in the polytechnic made as much as N20,000 weekly from this business even when he was not very serious with it. Not many know how much money there is in pop corn selling, but I will show you the little tips and tricks in this business today. All your questions will be answered on this article and if you have more drop them at the comments box. This pop corn business I am about to introduce you to is the single spot pop corn sales point. You must have seen some around the streets of Lagos if you reside in lasgidi. The author of wealthresult one time said; "It is almost selling faster than pure water maybe due to the convenient packaging.
" This may be true you know, or do you drink water when hungry? In this business you will be the maker and the seller if you like, so you don't have to spend on sales reps or bother looking for hawkers to patronize you. Believe me when I tell you those evening strollers would in a short time make your pop corn selling spot a regular joint. One other advantage this business has is that it is very cheap to run, because all the raw materials you need for production are around you and very cheap. Popcorn is a favourite snack for most girls due to its crispy nature while you chew. Also, if you are in an area with lots of kids, then you've hit a jackpot. The potential of making good gain from this business is very high so you have nothing to worry about. I have visited some pop corn stands and I have not seen anybody complain of not making profit from this business. Though if you run this business the wrong way, you may run at loss, so just follow my strategy. POP CORN MACHINE: This i the machine that helps cook and pop your corn. Ensure you go for the foreign popcorn maker because it is simpler to use, automated and comes with a warmer. You can get this machine for N55,000 or cheaper. You need a generator to power the pop corn machine as well know in Nigeria today, power failure is an household name. For you to show people your business isn't just a roadside thing you have to make branded bags/envelope besides it will keep customers coming back as it acts as an advert. It doesn’t cost much to get a professional branding for your business, employ a professional graphic designer to do it for you. Then use the design for all your nylons and other items like the popcorn wrappers if you are using wrapping papers. This is the main ingredient you need to start making popcorn. Buy enough bags of this at home so you don't ever run dry of it. If you don't have money to purchase the bag, you can buy a paint bucket for N25,000. For corn to pop, There should be certain amount of moisture within the corn, so that when heated makes it pop from the inside out, when a corn don’t get popped from inside out, it’s called a dud, which means there was not enough moisture in that corn. Look for sweet corn that contain enough moisture. Sugar, Salt, Butter – You need sugar and salt and butter to make your popcorn taste great. These one are difficult to get, go to any shop near you and buy as much as you need. Lastly, get training! You mustn't attend a physical class training, instead you can watch online tutorial videos on YouTube.